Jarte Plus allows the default shortcut key assignments to be modified or deleted, and it allows new shortcut keys to be created. First, find the command whose shortcut key assignment you want to change in the Commands list. The Command search box is useful for finding the desired command. Type in part of a command name and in the Command search box and the Commands list will instantly narrow to just the commands that contain the text you entered. Click the desired command in the Commands list. 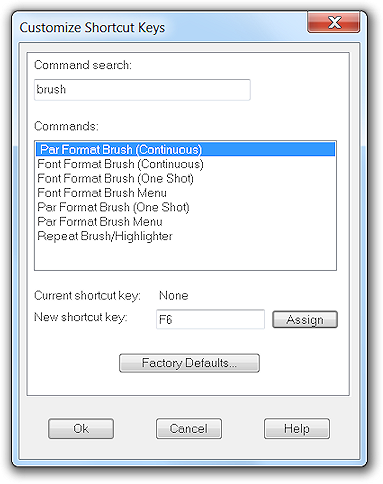 The shortcut key currently assigned to the command, if any, will be displayed. Click the New shortcut key box, press the shortcut key sequence you want to assign to the selected command, and click the Assign button to make the shortcut key assignment. If you simply want to remove a shortcut from a command then follow the same steps but press the Backspace key instead of entering a shortcut key sequence. The Factory Defaults button can be used to delete all custom shortcut key assignments and restore the factory default shortcut key assignments. When a shortcut key is entered in the New shortcut key field any existing assignment to that key is immediately displayed below the field. This provides a convenient means of quickly determining existing shortcut key assignments.